With over 20 years of experience, we offer a professional and friendly service specialising in first time drivers, nervous drivers, disqualified drivers, disqualified drivers and motorway driving. In addition to this we are also happy to do all we can to help our pupils pass their tests and beyond, by offering, help with theory tests, mock driving tests and pass plus. We feel that by offering a variety of choices we can adapt our service to meet your individual needs and so you can go at your own pace, hourly lessons, discount block bookings and intensive courses. For over 15 years we have provided a professional and friendly service to our pupils with a first class pass rate. We aim to give our very best to every pupil to enable them to achieve the high standards that are needed to drive safely on todays roads. With great patience we put at ease "First Time Drivers" and "Nervous Drivers," allowing them to build confidence. Our service offers multiple choices giving you great flexibility and the chance to go at a pace that is best suited to you. So whether you choose "Hourly Lessons" or an "Intensive Course" we guarantee to work with you to help you achieve your goals. In addition to this we offer help with your "Theory Test" and "Mock Driving Tests" to give you a better feel of what to expect on the day of your tests. After all is said and done we are willing to take things one step further by offering "Motorway Driving Lessons" and "Pass Plus" to build up your experience. If you are a disqualified driver then we are happy to help you through your extended test. We feel that to provide a good service we need to be adaptable, flexible and patient with the ability to listen to our pupils and that is what we offer you. Intensive courses include the application for practical and theory tests, use of school car for practical test, plus an hour before hand. A £100 non-refundable deposit is required. 1. PJ's reserves the right to refuse permission for any pupil to use a PJ's school car for driving test if in the instructor's opinion the student is not up to standard. 2. Cheques should be made payable to Mr P Mahon accompanied by a cheque guarantee card. 3. PJ's are most anxious to give customers the best possible service. If at any time you have complaint, please do not hesitate to bring this to our attention. Prices set by the driving standards agency. For reference only, up to date information here. You must answer a minimum of 43 correct answers to pass the test. We are happy to help you achieve the standard of knowledge required for these tests. We have a number of papers with a variety of Theory test questions to study at home. These questions are possible questions that could arise in the official Theory test. We will then mark your paper and talk you through any questions that you may have got wrong. The benefit of this is that it will improve your knowledge before sitting the official test and increase your chances of passing. We can also recommend the best CD's, DVD's and books for the Theory and Hazard Perception tests that are available to buy in the shops. Pass Plus is a scheme for new drivers. It's aim is to improve your driving skills and make you a safer driver and reduce the risk of being involved in a road crash. It can also lead to insurance discounts saving you money on your car insurance premiums. The scheme has been designed by the Driving Standards Agency (DSA), with the help of the motor insurance and driving instructor industries, to develop your skills and knowledge in areas where you may have limited experience. The Pass plus course has been designed in six modules. These modules will not all take the same amount of time to cover. However the course must consist of a minimum of six hours tuition. Read more reviews on the Yellow Pages. I did 3 lessons booked my driving test only one I could get was for next year but ok got me one for 4 weeks after my test passed with flying colours. My son had weekly lessons with PJ and progressed well. We had a test date of mid November but PJ felt he was ready to take the test earlier so PJ changed his test date and in mid-October he passed with only 4 minors. PJ has an extremely calm demeanour, was punctual and varied the routes each week to give as many driving conditions as possible. He was also very flexible if we needed to change the day or time. The later lessons and the test itself was taken in my sons car and as a parent I feel very confident in my sons driving ability. My son has just passed his test first time with PJ, he is a great bloke and a kind and patient driving instructor. PJ helped him with his theory test and gave him pc discs to help him revise, i passed my test first time too as well as other members of my family, would highly recomend pj and wouldnt use and other instructor for my other kids when its their turn . Only had a few lessons with him and he helped me a lot, passed first time. Would definetly recommend him. Thanks very much mate. I passed my test today with only one minor thanks to Pj, the most patient person ever. He is very professional at all times and very good at what he does. He is a very good teacher who is also very kind and encouraging. He helps you with your theory test by giving you a range of materials to help you learn. I can't thank him enough and would highly recommend him. Our daughter passed her theory and practical test time. PJ is very reliable, honest, persistent, patient and committed to his pupils. Provides a DVD to practice for your theory test, examples of show me/tell me questions and provides a mock test prior to the actual test, which gives you a clear indication of your strengths and weaknesses. Would highly recommend PJ. PJ taught both of my daughters to drive. My eldest a very confident young lady and she passed first time. My youngest a different kettle of fish altogether. I did warn PJ that teaching my youngest could bring on an early retirement. From the start she was a very nervous and sensitive pupil PJ gauged this and did everything he could to ease her nerves and make her feel confident. There was a couple of lessons when she came home feeling a failure and PJ handled this by taking her out again the next day free of charge to gain her confidence back. He would take her out in the car for longer than a normal lesson and not bring her back until he felt she had regained her confidence. I couldn't have asked for a better instructor. My daughter passed her theory first time thanks to the help from PJ and her driving test first time as well he was genuinely pleased for her. I cannot recommend PJ highly enough. I have recommended PJ to a number of people and they have all passed first time. Provides an amazing service. You even get a cd to watch when you are preparing for your theory. You also get to take home sheets of paper to help with your practical driving test. I passed my theory and practical driving test first time with PJ. Highly reccomend this driving school. PJ is an excellent instructor and made my experience of learning to drive a lot easier. He's very patient and a great guy and definitely put me at ease. He made learning to drive enjoyable instead of being a daunting experience. He gave me all the CDs and paperwork I needed to be able to pass both my theory test and practical test first time. He was recommended to me and I would happily recommend him to anyone else. I would recommend doing your lessons with PJ as he builds up the confident you need to get to were you want to be!I done my test yesterday and past 1st time I with him! PJ has been nothing but helpful since I started with him in September 2016. He's very flexible and understanding, also very committed. To help me with my theory test, he gave me a CD which really helped with revision allowing me to pass first time. He also moved my test forward after noticing I was ready earlier, which was a good thing to do, as I passed my practical test first time with only 1 minor. Very good instructor, and a very nice, easy-going guy. PJ is a fantastic driving instructor and helped me to pass first time. He is very supportive with all aspects of driving- providing me with useful CD's and worksheets to assist with my theory test, and also tips for the practical. The lessons were always enjoyable but also very productive. Every potential test route and manoeuvre is covered thoroughly, which enabled to feel very comfortable leading up to and during the practical test. The mock test he devised was incredibly relevant to the actual driving test and allowed me to understand areas for improvement. PJ inspires his students to en joy driving but to do so safely. I am very grateful to him and think he is a great choice as a driving instructor. Really had an excellent learning experience with this instructor, i suffer quite bad with nerves and he made me feel right at ease. He also rewards your hard work, I got an earlier test date as I was making such good progress. He constantly made himself as available as possible to fit my work schedule and days off. I passed first time and would highly recommend him for anyone looking for similar results. PJ is a great driving instructor, he makes you feel really comfortable when driving and I would recommend to anyone. He never watches the clock for your lesson to end and always sits and talks to you after for as long as you need after so that he can explain what went well and what didn't so you can be better next time. The week before my test PJ felt I needed more lessons (after a very bad mock test), so he got up much earlier than his usual driving times and stayed out much later all through the week so that he could fit me in, and I ended up passing first time. He also helped me with my theory test, giving me dvds and asking me the questions whilst I was driving so that I could see and understand the theory in practice. I can't thank PJ enough for his help and I'm going to miss how much fun it was driving with him. Great instructor. Explained very well and was patient. I was recommended by a friend and I will definitely be recommending to my friends and family. With an instructor that has one of the highest pass rates it's a no brainer. PJ is a great driving instructor and made me feel very comfortable whilst I was learning to drive. Thoroughly enjoyed the lessons I had with PJ. I would definitely recommend PJ to any learner! Passed first time, excellent instructor and would highly recommend to friends and family! I first had driving lessons 15 years ago but never got to the test stage, so I was pretty nervous about learning to drive again. PJ put me at ease straight away and is always calm in any difficult situation. He has an extensive knowledge of Stevenage and the surrounding areas, including the test routes which was a real bonus. Although there are long wait times for tests, PJ felt I was ready before my booked test date and managed to bring my test forward for me by a few weeks which was great. Although I was really nervous on the day, I passed 1st time with only 1 minor! I would highly recommend PJ to anyone who wants to learn to drive. PJ is an excellent driving instructor and I would 100% recommend him to any learner! He really goes out of his way to help his students feel calm and comfortable. Every single lesson I had with PJ I thoroughly enjoyed and learnt everything I needed to know. If I couldn't make a lesson he would make sure that I got another ASAP. He is very professional and has a great sense of humour. Thank you for all your help PJ, I couldn't of done it without you!! Top driving instructor . Passed with pjmakes u feel comfortable and someone u can have a laugh with while driving x thank u pj. PJ is an excellent instructor, very patient and always manages to fit you in for a time that suits you. The use of mock tests helps to see what you need to improve on specifically in order to pass your test. He also helps with theory revision too which is unusual with other driving instructors. Never late to lessons and overall a very helpful man. PJ is a brilliant instructor, happily fit in my lessons around uni and work!, passed 1st time and a massive bonus of no minors!Highly recommend PJ as a driving instructor no matter the age. Thank you very much PJ! Very good instructor passed 1st tym thanks pj. I cannot fault this driving school, PJ himself is very welcoming and made me feel at ease straight away, a perfect instructor and I would definitely recommend to anyone! If it wasn't for him, I definitely wouldn't have passed my driving test, he is also flexible and on time to all of the lessons I'd had with him, I cannot thank him enough! Pj is a great driving instructor he makes you feel very calm and confident in the driving seat and is also very patient when you make little mistakes, i had never driven a car before in my life before i booked lessons with pj but with his help and experience i was able to pass both my theory and driving test first time, so thanks again pj very appreciated From Nicky Helm. Pj was an excellent in making me feel relaxed and confident in all areas of my driving. He used his experience to know exactly when I was ready to pass my test and was even able to bring it forward a few weeks. He is very friendly making my lessons enjoyable and was able to accommodate my lessons around my job. This is perfect for a relaxed and carefree learning environment for young people to learn to drive in. For those people who need a lot of practice and telling a few times before they get the hang of driving, the instructor is very patient and encouraging. Great if you want someone reliable and cheap. Was with pj for about 6 months and past first time with 0 minors always had my lesson every week never late and overall a really really good instructor would highly recommend! PJ is an outstanding teacher and I have had the most enjoyable driving lessons with him. He does not enter you into driving tests unless he believes your ready, which saves you lots of unnecessary fees. Always on time and gives you the most he can for your hour of driving. He also strives to secure close test dates for his students and tries his best to find cancellations.Really recommend, I know I will be safe on the road with the knowledge and skills I picked up with PJ. I was extremely nervous when I first started to learn to drive with PJ, as I had no previous experience and I had been putting off having lessons for years. PJ was so patient with me and made me feel comfortable and confident and I ended up passing my test first time. PJ was an excellent driving instructor and was patient and calm throughout all of my driving lessons. I passed my test first time with only one minor, which shows how experienced he is at being an instructor. Would highly recommend to anyone who is looking to start driving lessons. Excellent tuition. Another first timer. I recommend to go with PJ! When I started with PJ I was a very nervous driver, he made me feel at ease and comfortable. I passed my test recently and would recommend him to anyone. Brilliant driving instructor. Never driven before I started lessons with PJ and passed first time all down to his patience and ability to keep calm. He always tries to do what's best for you and his experience as an instructor shows! Definitely recommend!! Ty PJ. PJ is an fantastic driving instructor, his 15 years definitely show with his methods, driving style, and patience with new drivers. As someone who had been taking lessons on and off for years he really helped me gain perspective and focus to get through my test.I would highly recommend him to anyone who is learning to drive. A great driving instructor, helped me pass first time. Gave me a lot of information and taught me fast and efficiently. Past first time!! Very good driving instructor, has a lot of patents and gives you a lot of confindent. I would 100% recommend pj to anyone!!. Pj was very helpful and patient when it came to helping me learn. He helped me massively when it came to my theory by giving me loads of content to help with revision. He was always positive when it came to my lessons. He always had an extra few minutes to help and talk me through things after lessons. I passed first time on my driving test with 0 minors. Very helpful and would recommend to friends. PJ is an excellent driving instructor with great knowledge and skills. I would defiantly recommend PJ as a driving instructor for any learner. He helped me pass my theory and my driving test first time with 3 minors. He really goes out of his way to help his students and to make sure that they pass first time. Every single lesson I had with PJ I thoroughly enjoyed it and if I couldn't make a lesson he would make sure that I get a lesson sooner. He is very professional and has a great sense of humour.Thank you for all your help PJ. Very patient instructor !! Helped me past first time always made my lessons worth while. Amazing thank you so so much! Great instructor! Patent, punctual and very informed. Can't thank Pj eniugh for getting me through my driving lessons and to pass my test 1st time with only 2 minors. Pj is a brilliant nothing is to much trouble for him. He never clock watches, goes out of his way to help you. Helped me with my theory. Highly recommend. I was recommend by 2 friends. Now I would recommend him to anyone that's learning to drive. Found this instructor through this site and hoping other people will find him as well, Pj is a brilliant instructor constantly making you more aware of the road and rules as you progress through lessons, will always be recommending this instructor to family and friends. After any lesson with Pj you will not be left empty handed you will always come back with some different bit of knowledge about road rules or road users. Cannot say enough good things about pj, very professional, very patient I have and would recommend happily. Thank you for helping me pass my test. Pj is a brilliant driving instructor. Very patient and puts in the time and effort to help you with both your theory and your practical. Would recommend him to anyone and very happy to say he helped me pass first time! PJ was a great instructor keeping me calm throughout my lessons. He made me feel comfortable and relaxed but also made me enjoy driving. PJ took me to Hitchin and Knebworth to help me learn in different environments on the test routes. He supported me through my theory test and also helped me pass first time in my practical. P.J is a brilliant driving instructor. He is very understanding and patient, and is also very calming for nervous drivers. He's happy to have a chat whilst you drive which makes the lessons easier, and I would definitely recommend him to any new drivers! After about eight months with him I passed my test first time with only one minor. Thank you P.J. PJ has a no nonsense approach in his lessons, and will make you feel very comfortable and safe. Though he's a tough instructor he has a great sense of humour and it fun to chat to which helps you to settle in if you're a first time driver. PJ is very experienced and will go beyond getting you up to 'test standard', but also prepare you for real life situations. Thank's PJ for all your hard work! Can't fault P.J.. Excellent and patient instructor. P.J taught my son to drive and then after passing his test took him out for his motorway lesson. Will definitely use P.J again when my youngest child learns in two years! 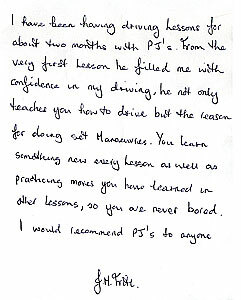 Having had PJ recommended to me by a friend I would be the first to recommend him to anyone wanting to learn to drive. Having started with little experience and lacking confidence, PJ made me feel at ease and offered a lot of support with both the theory and practical and as a result I passed first time in both exams! Hi I learnt to drive wiv pj on my 17th birthday he was very friendly helpfull caring an help me pass my theory first time he help me feel relaxed in my lessons an I was so happy to pass my test first time would deffo recommend him !!!!!!!! I have been with PJ's school of motoring since November 2013. I passed my theory and practical first time under 8 months, I passed the practical with absolutely NO FAULT & NO MINORS. I passed the practical with absolutely NO FAULT & NO MINORS. I can assure you that you won't be let down with PJ's school of motoring, he caters for all types of people, like myself, I was very nervous and not very confident before I started taking lessons with PJ, however, after a few lessons kicked in, I learned how to read the road and my overall confidence to drive was immediately boosted. I noticed a rapid improvement each lesson I took with PJ, he is very clear at explaining things in depth with the diagrams and methods he has to help you learn. His lessons are very high quality and enjoyable, you will always finish each lesson with a smile left on your face. PJ is very flexible and really makes an effort with committing himself to help you get up to standards to pass your test. He is very friendly, and I always felt very calm whilst driving with PJ. I have recommended PJ to my friends & family. PJ School of Motoring is an excellent Driving School,calm, friendly and highly experienced. Both our son and daughter learnt with them. They adapted the pace of learning to suit each of their needs allowing them to grow in confidence by developing a strong skills base. they both felt well prepared for the test having practised under test conditions on test routes. the results speak for themselves as the both passed first time! I started learning with PJ in July of 2011, and passed both my theory and practical test first time within 9 months. Lessons moved at a pace I was comfortable with and showed improvement week by week. In practise for my theory test, homework was set to practise the questions which I found a very useful way of revising and learning all I needed to know. If I had any queries PJ would go over these in the lessons to make sure I was 100% on them. To build up to the practical test, mock tests were taken and improvements made upon what didn’t go as well. All routes are practised in lessons to give a wide experience of driving to places such as Hitchin and Knebworth a variety of ways as well as around Stevenage. The test is only taken when you’re ready and confident so you don’t feel unsure about the test. I have recommended using PJ as a driving instructor to friends and family members due to my positive experience of learning with him. My son learnt to drive with PJ’s school of motoring this year. PJ has a good reputation and came highly recommended. He has a great first time pass rate and my son is now one of that group. My son always came home positively enthused and couldn’t wait for the next lesson. I have recommended PJ to my friends and will continue to do so.